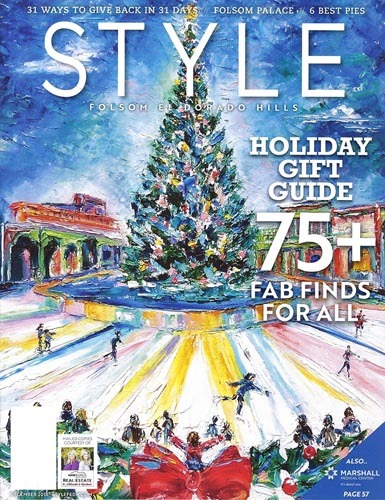 I’m excited to share with you the Style Magazine COVER for December 2018. The design was created for the Folsom Chamber of Commerce and displayed throughout downtown Folsom (Sutter Street) over the holidays. All of the artwork that I’ve created for the city reflects the love that I have for Folsom; they are my attempt to share the feeling of Folsom that keeps people coming back for more. My art is used commercially in Folsom, California, and can be found on 120+ banners and posters all along Folsom’s main streets – Folsom Historic District, Folsom Dam Road, City Hall, Outlet Mall, the Palladio, and more. My work with the city started in 2013 when my ‘Cowboy Boots” were selected to advertise the 2013 Folsom Rodeo. Since, I have done commercial art for many Folsom events, including the California 2014 and 2016 Amgen bike race and the 2013 Folsom Rocks night. I have been told that the thick texture palette knife work and ‘POP’ effect are very popular with Folsom residents. I continue to paint ‘the feel‘ of Folsom with gratitude and with joy. I paint only with palette knives. No brushes are used. I hope you enjoy my art work. I still cannot believe it…but some people really never die. Experienced the most enormous surf in Carmel this month, March 2016. Create a special memory of a person or place for the any occasion. All oils original and gallery wrapped.